Thank you for your support of the Charger Soccer Club in the inaugural 5K and 1 mile run on Sunday, September 16, 2018, at Eddie C. Moore Complex in Clearwater. The race is something we intend to bring to you every year in Clearwater. The morning with begin with check in at Eddie C. Moore at 8 a.m. The 1 mile distance will begin at 9 a.m. and the 5K (3.1) mile run will start just after the 1 mile is complete at 9:20 a.m.
An email will go out from our race management team (Suzanne and Michael Mannino of Xanadu Race Management) the Friday prior to the race to give you all the final updates you need regarding parking, bib number and shirt pick up, what to bring, etc. All 5K participants will be electronically timed by the run bib number you are assigned and given at check in on event morning. Please wear this number on the front of the shirt you will be finishing the race wearing. The one mile run at 9:00 a.m. will be clock timed only with no recorded times kept. This is a "finisher's" distance run or walk. If you want to keep your time during the one mile please wear a watch. 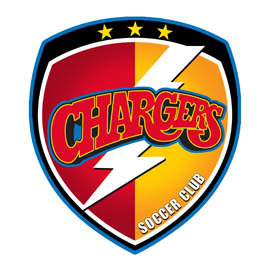 Thank you for your support of Chargers Soccer Club! Your participation supports the Charger scholarship program and keeps our club CHARGERS STRONG!